Brazil Team at 2016 Copa America Centenario, Brazil team Schedule at 2016 Copa America, Brazil team Results and Squad list at Copa Centenario. 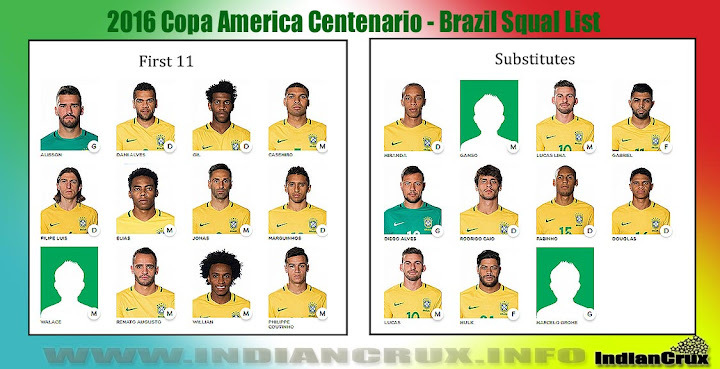 Brazil played their first match against Ecuador on 5th June 2016 and it was a goalless draw. Second match was against Haiti won by 7-1, however the loss of last match of group stage against Peru knocked out Brazil to out of Copa Amercia 2016.